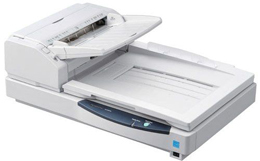 Settings can be made with a single press of the button while confirming the desired settings with the scanner's LCD and cursor buttons Double-sided scanning of documents from business-card size all the way to A3 can be done with a single scan. Plus, double-sided scanning is done at the same speed as single-sided scanning. This eliminates the work of pre-sorting, and prevents pages from being missed when scanning. Documents with different sizes and thicknesses can be fed together. They can be center, right or left justified. By using left or right justification, there is no more need to spend time organizing documents according to their size, so scanning is fast and easy. This function greatly increases your productivity. Files can be named by a free combination of 20 items on the screen. This saves the trouble of typing complicated file names and also prevents file name mistakes. Real-time auto-rotation, auto-color recognition and other powerful features that enable it to scan at an impressive class leading 95 ppm/190 ipm in color or monochrome, landscape. Any specific colour ranges up to 3 on the document can be selected as a drop out colour. THis is useful when the colour ruled form paper or colour background paper is scanned for improved OCR function. 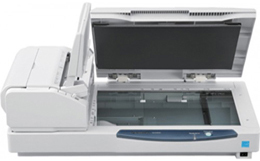 Straight pass mode allows "Long Paper Scanner", thick and thin paper scanning. Adobe® Acrobat® Standard and Image Capture Utility are included with the Panasonic KV-S7097-V scanner, which allow you to quickly and easily integrate your workflow. Physical dimensions 29.7 x 20 x 11.4 "